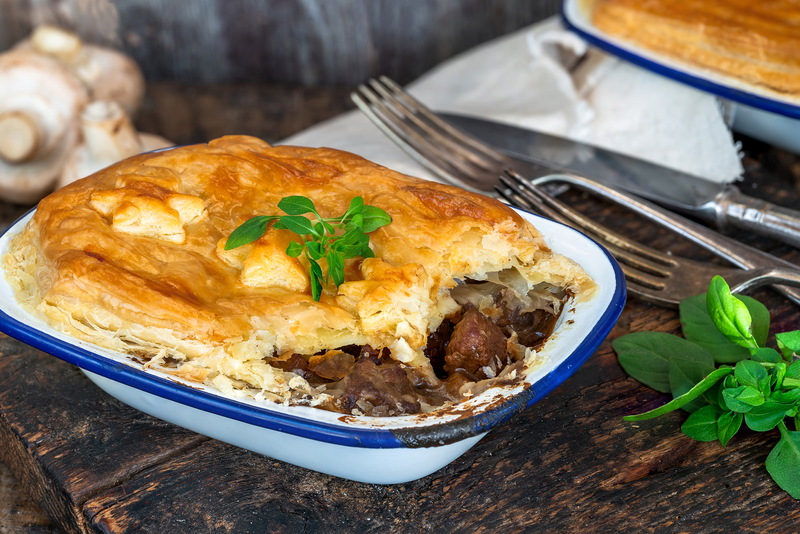 Beef, mushrooms and a thick red wine gravy surrounded by short, buttery pastry – we can’t think of anything better. Which is why, to celebrate British Pie Week running from the 4th to 10th of March, we’ve decided to share this special recipe with you. Also on the blog: What wine goes with roast chicken? Shaun Foster works in our Theale shop, but before he started offering customers his invaluable wine advice he worked as a chef. So we picked his brains for his tricks and tips for making the perfect steak and mushroom pie. Heat a little more oil in the same pan and cook the onion, once translucent add the meat back into the pan with the onion. Once cooked remove from oven and place in a clean oven dish (the consistency should not be runny, it should have thickened) remove the bay leaf, season to taste using salt and pepper and place your pastry over the top. Using a pastry brush, brush your pastry with the egg-yolk and make a hole in the centre to allow steam to escape and bake in the oven for 20-25 minutes to cook the pastry. Serve immediately.